Welcome to Critic's Notebook, a quick and off-the-cuff car review consisting of impressions, jottings, and marginalia regarding whatever The Drive writers happen to be driving. Today's edition: the 2018 Audi Q5 2.0T Quattro in Prestige trim. The 2018 Audi Q5 is the midsize crossover my fiancée wishes we owned. I know this for a fact, because she wouldn't stop saying it for the entire week we had one at our disposal. My 2014 Jeep Grand Cherokee is plenty nice, and its beefier proportions provide tons of utility, but even I can admit that the driving dynamics and interior design don't compare to this pretty little German ride. My loaner Q5 offered both a luxurious experience for passengers and an enjoyable one for its driver, something we came to appreciate while we cruised around New York City suburbs, soared over the Verrazano-Narrows Bridge to the Rockaways for a beach day, carted three friends in the backseat, and swapped out our grill's propane tank at Home Depot. (If you've read any of my car reviews, you're probably beginning to realize I spend a lot of time at Home Depot.) 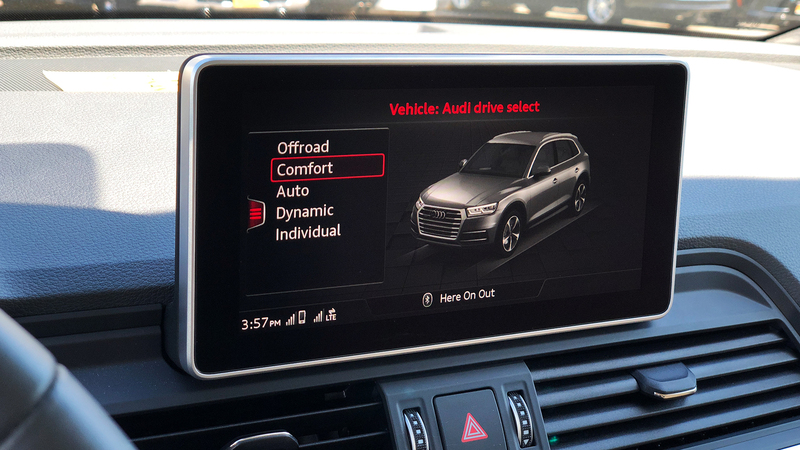 The Q5 has never wowed me with its exterior, but as the old adage goes, it's what's inside—and under the hood—that counts. That Utopia Blue paint job helps jazz up the unexciting exterior styling. Just looking at the Q5, you don't expect it to be particularly fun to drive. But while I experienced a bit of turbo lag during drives to work among the NYC area's super-aggressive commuters, the 252 horsepower and 273 pound-feet of torque in this iteration (up 32 hp and 15 lb-ft from the first-generation version, thanks to an updated engine) make this SUV feel downright peppy. The ride quality is fantastic. That NJ-to-NYC commute takes me to work via a route littered with potholes and tighly curved on- and off-ramps, but the Q5 handled it all with ease. The suspension absorbed everything nasty I encountered, and the vehicle felt well-planted through every twisty turn. The interior screams premium, with its high-quality materials and high-tech functions. 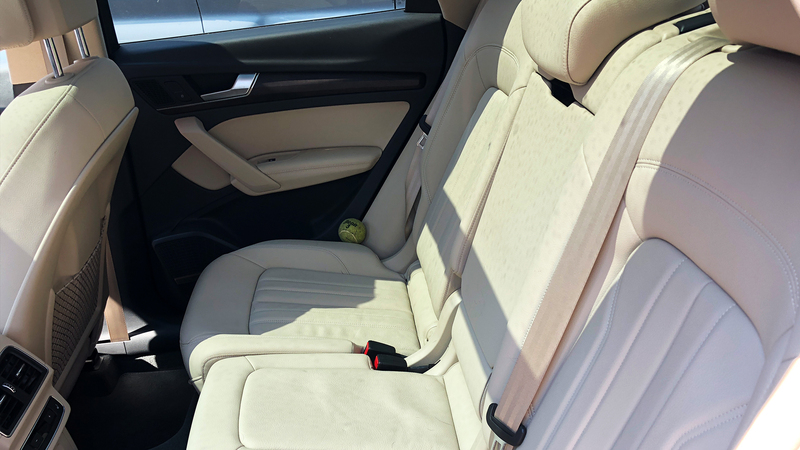 One passenger said he thought the light-colored leather dubbed "Atlas Beige" and the dark accents known as "Fine Grain Ash Gray Brown" natural wood inlays (an $850 option) were bougie and uninspired, but the Basic White Girl in me was a big fan. 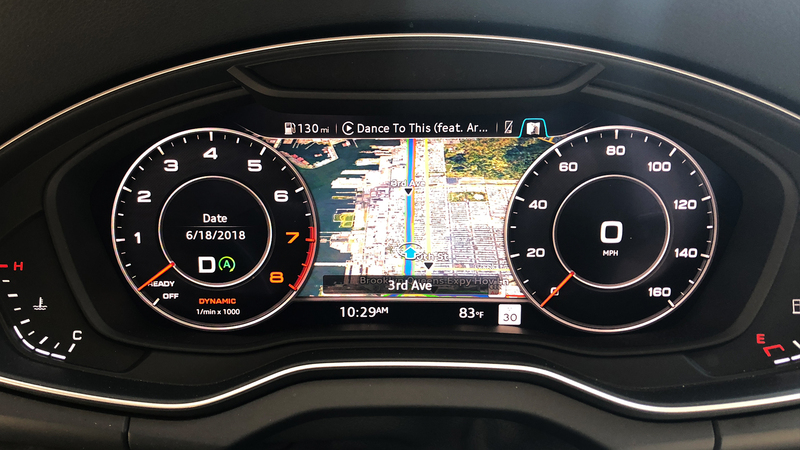 My tester also came with Audi's Virtual Cockpit instrument panel, which trades analogue gauges for a configurable digital LCD screen. 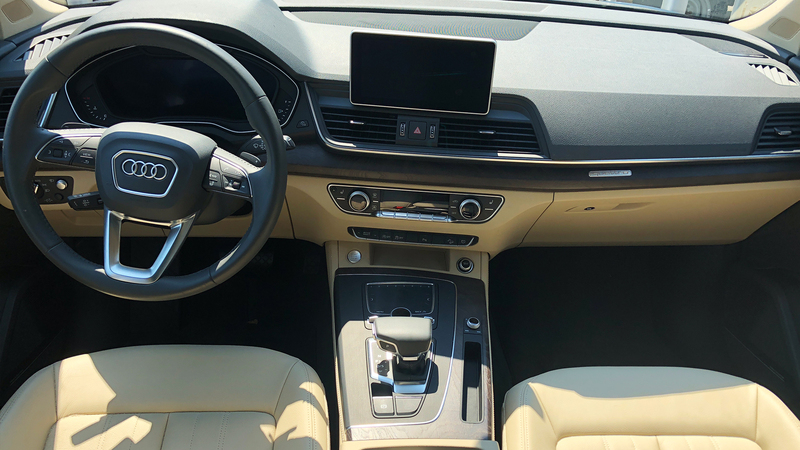 This, along with the sizable tablet-like infotainment display, added a level of tech-savvy sophistication to the interior experience. 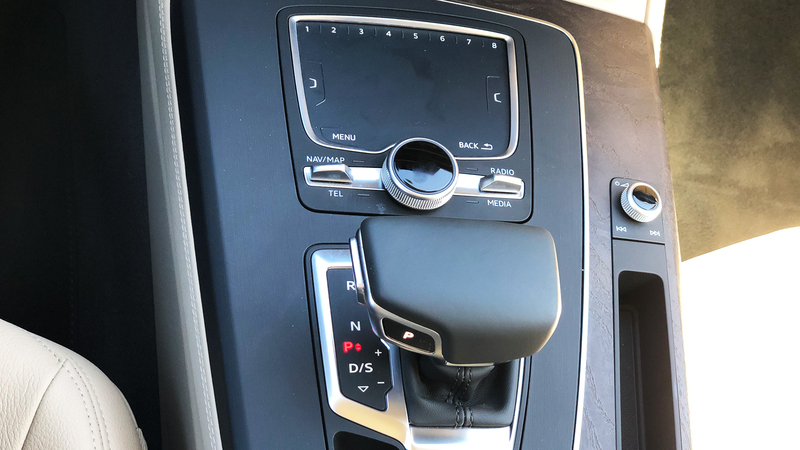 And while it may take drivers and/or riders a bit of time to familiarize themselves with Audi's MMI infotainment system, the whole setup (eventually) feels seamless and logical, right down to the placement of the MMI control dial. I wound up resting my wrist on the shifter while controlling the MMI screen with said dial without my hand feeling a millimeter out of place. All-wheel-drive is standard, which makes all the sense in the world to me, especially for a crossover. Inconspicuous exterior styling makes the Q5 a bit forgettable. The exterior design, simply put, doesn't enthrall the eye the way some other SUVs do. That said, the Utopia Blue metallic paint job on my loaner (a $575 option) helped better define this crossover's looks. This Audi can get very expensive very quickly. This tester benefitted from the $9,300 Prestige trim, which includes the aforementioned Virtual Cockpit as well as a panoramic sunroof, heated front seats with driver memory, full LED headlights, and 20-inch wheels, to mention a few. Want to warm backseat butts or your steering wheel? Add $500. Interested in the driver assistance package? That's another $1,800. Easy to see how the price tag can shoot by $50,000. Those backrow butts will probably only feel comfortable seated behind the driver or front passenger. The middle seat passenger was pretty squished while driving with three full-size adults in the second row. Though the 2.0-liter turbocharged inline-four feels well-suited to the second-gen Q5, our friends in Europe get additional engine options like the 3.0-liter turbodiesel, which packs more power (282 hp) and way more torque (457 lb-ft). 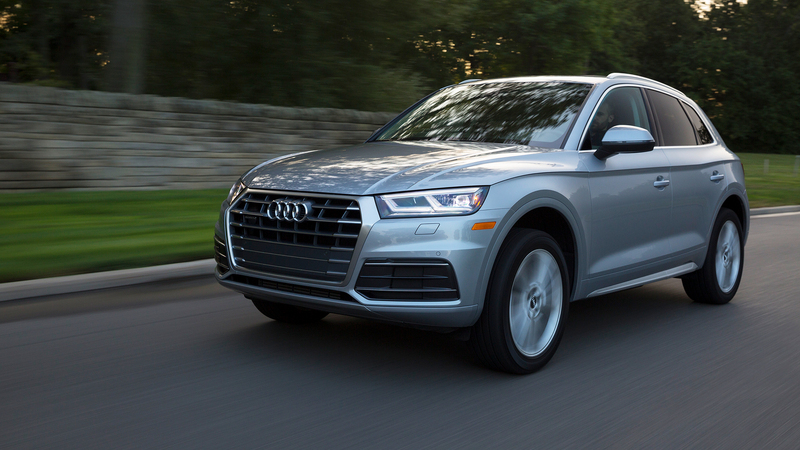 The Q5 is Audi's best-seller in America, and with this solidly upgraded second generation now firmly established on the streets, it'll likely continue to be a winner for the brand—despite the aggressive competition in the the midsize luxury crossover market. If you're shopping around in this category, don't judge this book by its cover. Judge it by the nimble, updated chassis and seriously top-notch technology. Or you can just take my fiancée's word for it. Critic’s Notebook takeaway: Soldiering on, but ready to be put out to pasture. We went to Italy to whip the GLE's plucky little brother around the Alps.